There’s something vaguely prehistoric about fava beans in the shell, all lumpy and enormous — and requiring that you buy them by the bucket in order to yield sufficient edible morsels beyond just a handful. But the delicate, nutty flavor within the two layers of shells (the pods and the skins) is worth the paces we go through to extract these sweet green lovelies. When he sees me coming back from the farmers' market toting a bag bulging with favas, my husband rolls his eyes and finds something else to do. He's done sous-chef duty more than once, ripping the beans from their pods and blanching them briefly before finally removing the individual bean skins to reveal the bright green meat within. But he’s always happy afterward, as we savor warm favas with mint and lamb chops, or toss them with cream and peas and crab over pasta, or purée them and spread them on crusty grilled bread. Recently, however, my friend Ryan — one of my world’s great cooks and an encyclopedia of food knowledge — changed our fava-loving life. “Just grill them,” he said. “No shelling, no blanching, no green mush under the fingernails?” I asked, incredulous. I couldn’t believe it. 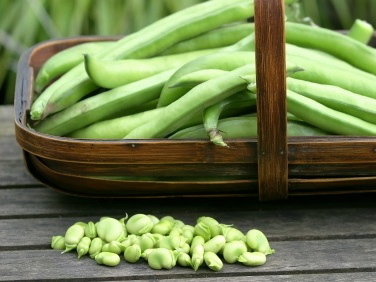 Shelling and blanching had been part of the deal, the tedium that earned us the wonderful pleasure of fresh favas. But he was right. The shells blistered and produced beans that slid out of their skins with ease — and we were licking our salty fingers in no time.